Yesterday, the Old Rag Mountain Stewards helped my daughter out in a big way. 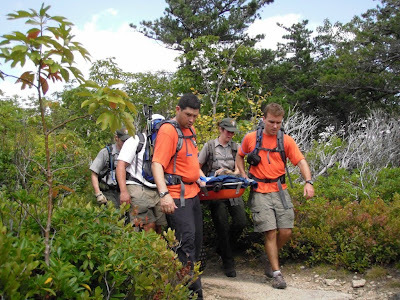 I want to thank them again for all their help in getting her down from the summit of Old Rag Mountain. We made it up through the rock scramble early yesterday morning with XXXX leading the way. We decided to return from the summit through the rock scramble and she took an unfortunate fall. We were immediately assisted by fellow hikers. Our cell phones were getting no signal. A couple of other female hikers did very well in keeping her calm. Within 40 minutes of her fall, Jeremy and Ben, Old Rag Mountain Stewards, were on the scene to help. In all 5 Stewards and many park rangers helped her off the mountain. Throughout the ordeal XXXX was a trooper. Thanks to many she remained calm. As it turns out she broke her leg in two places. She has a break through her lower fibula and another through her ankle. Other than the disappointment that she will miss her entire soccer season, she is doing fine. I don't recall everyone's names yesterday that assisted her; however, I want to thank all of you again. You are true professionals and provide a great service. Job well done yesterday!